"Showcasing unique, one of a kind, handcrafted works of art made by members of the Craft Guild. You will see and have the opportunity to purchase artists' works in jewelry, glass, pottery, sculpture, hand-bound books, paintings, drawings, photography, and fiber art. During the four-day Show and Sale, our studios will also be open and will feature live artist demonstrations. The public is invited to attend the free opening night reception Thursday evening from 6:00 p.m. to 10:00 p.m. featuring live music, refreshments, and a silent auction benefiting the Craft Guild of Dallas." "Please join P.E.O. Chapter FV, Plano, at our annual fall bazaar, "Inspired Creations for You and Yours". Have a cup of coffee and enjoy a cookie while you browse our tables of Christmas decor, stocking stuffers, ornaments, handmade items and many, many lovely gift ideas. Bid on silent auction items such as an exquisite blue and white hand-stitched quilt. Take home some of our delicious fresh baked goods and delight little ones with some of our charming children's items. All proceeds go to scholarships, grants, and a college supported by PEO, an international philanthropic organization dedicated to promoting educational opportunities for women." "New Hope Baptist Church is sponsoring a "Holiday Crafts Fair", November 1, 2014 from 9:00 - 4:00 p.m. We are located right off Hwy 380 on Hwy 377, Aubrey, Texas. 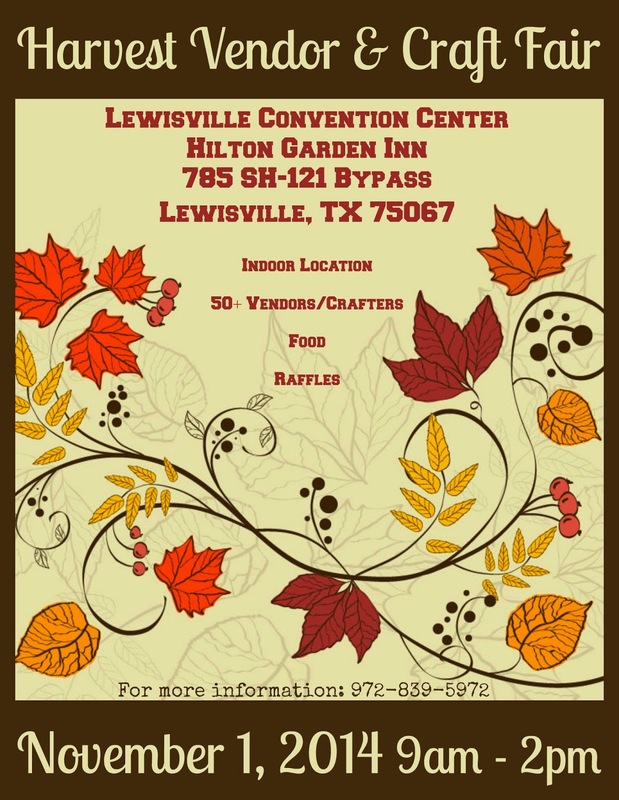 We will have a variety of vendors for your holiday decorating and gift shopping. Please mark your calendars for this event as we would love to have you stop by and shop!" "The Islamic Art Revival Series (IARS) in partnership with LuminArté Gallery presents an international exhibition of contemporary Islamic Art with an opening reception to the public on November 1, from 6:30 – 9:30 PM. This prestigious international exhibition includes artwork in a variety of styles and media, inspired by Islamic culture, art, literature and architecture. In this installment, 46 artists are participating from 17 countries including the USA, the United Kingdom, Iran, Bulgaria, Jordan, Saudi Arabia, Sweden, Japan, Egypt, Pakistan, Canada, Singapore, Lebanon, Switzerland, Qatar, Mexico, and Cuba." "Get a jump on your holiday shopping! Unique handmade crafts, gifts, and holiday decor!"